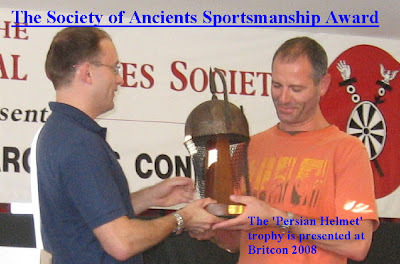 Richard Sullivan, Marketing Director of Osprey Publishing presents the Society of Ancients Sportsmanship Award to Pete Dalby at the conclusion of Britcon 2008 - the UK's National Wargames Convention. The trophy is presented to the top player from scores awa rded by their opponents over the six games. Congratulations to Pete who - whilst earning the respect of his fellow players - also scored enough game points to come third in the Field of Glory (15mm) event. Our thanks to everyone who participated in this scheme. It relies on the support of the players. 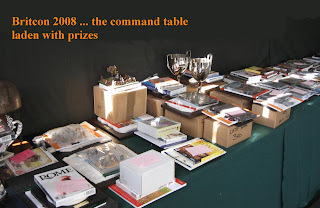 Great job, too, from all the event sponsors - the stacks of prizes at Britcon just seems to get bigger and bigger. 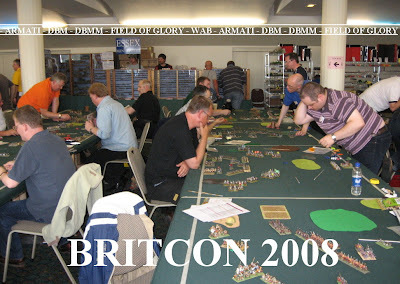 Show or no show, Britcon is about wargaming - and ancient period wargaming at that. A quick tally on my fingers suggests that over 120 players took part in the ancients categories this year. 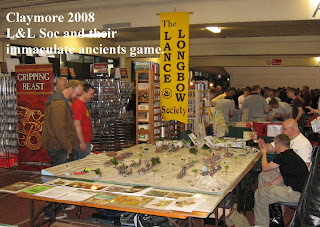 With so many players involved, the choice of many Committee members and activists is to enter the events over the weekend - so our thanks also must go to Dave, Steve and co on the Lance and Longbow Society stand for covering the Society of Ancients pitch as well. Because of the big 'ancients' audience attending the event, we picked Britcon for a special promotion of the revamped Slingshot. Hopefully, any non-members who attended the show were able to get a complimentary copy of the July issue as part of their 'show goodies'. OK, a bit of showing off - we are proud of what the upgrading has been able to achieve ... but we also realise that the very best effect will be if the 'flip appeal' of the journal encourages a few more fellow enthusiasts to come join us. Successive editors have done a great job maintaining the traditionally high standards of historical and wargames content and independent commentary. We must ensure that the production qualities draw as numerous and diverse a readership as that content merits. As I said to the many interested browsers at Britcon, joining up on-line couldn't be easier ... there is more information and a Paypal button at the website (here ...), and, if you want to get more details of what you'll find inside Slingshot, the editor maintains a contents and support page (here ...) . The Society, of course, offers an extensive range of publications and games written by our members, and, as well as Slingshot, membership brings access to that publishing scheme, special prices on Society goods, together with a long list of trader discounts between 5 and 25 %. OK - that's what the show team did at Britcon ... we played wargames and gave out complimentary copies of Slingshot. What else went on? Well, part of the ceiling collapsed, it rained (OK, it's Manchester ... it rains ...) ... we celebrated the 50th birthday of a well-known Wargames Society President ... Mike Bennett won the DBM event ... Steve Metheringham won the Armati ... Ian Speed won the Field of Glory 25mm category, Stuart Whigham the DBMM. The big one, the 62 player Field of Glory 15mm event was won by Graham Evans, and former SoA Committee man, Tony Garry, won the Warhammer Ancient Battles. Congratulations to all of them. Indeed, current Committee members were not far behind. 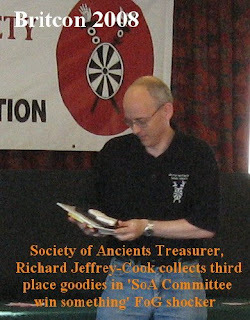 I'm sure you'll indulge me slipping in a snap of SoA Treasurer receiving his 3rd place award in the 25mm FoG event. Congratulations to Richard, who has found the time - in amongst keeping the ship afloat and resourcing the new Slingshot - to learn a new set of wargames rules more comprehensively than the rest of us ... (or that's what the results say, anyway ..). OK, I did get a few photos, but I must confess that Field of Glory (certainly for us beginners) does take a bit of playing, and the Britcon schedule is very compressed. Why do wargamers want to start at 8.15 on a Saturday morning? With game time an issue, I much prefer the challenge of responding to a randomly drawn 'pre-set terrain' table than do all that faffing about to set up every game from scratch. I've done many rounds of the FoG set up game, now. It works. It doesn't look great (the BHGS gave up its half-hearted incentivizing of presentation a while back ...) .. and although it is less 'gamey' than DBM (in truth much of it is a return to the BHGS version of DBM), it is still player manipulated, so is still artificial. Of course, the price of playing over such a player manipulated felt landscape is getting up unreasonably early and not having any proper breaks. I hope the BHGS rethink this aspect of an otherwise great weekend. We should have a more civilized mix of game time and social time (and start time...)..
Hawkwood's lot? Oh, they suffer the usual non-Roman Italian prejudices in the FoG list (everything drops a morale grade because they're Italian - even if they are veterans of the 100 Years War ...) - just like the WRG games.... Never understood that. Historically, these are the most accomplished, experienced and professional armies in the history of medieval Europe. But in FoG it's low grade because it isn't English, French or Serbian. So its cheaper, but needs to keep very compact and mutually supportive. I like it because it looks great, it is unashamedly Italian, has as good a mix of flags and banners as it does of troop types - and you can command it with the Diabolical Englishman .. the greatest soldier of the age. Oh yes, the condottieri never were broken, and, without ever routing, the army won more games than it lost. 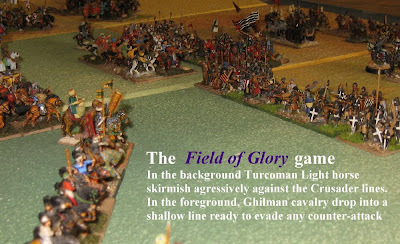 This report does not attempt to give a fair and comprehensive review of Field of Glory. 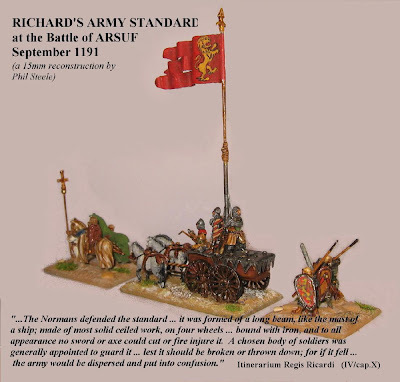 It does attempt to tell you what happened when we set up our Shows North Armati scenario (here ...) for Arsuf, then played through it with Field of Glory. The game should have a chance of working ... the scenario's orders of battle followed the historical encounter as best we could accommodate it, and both games are unit-based (in FoG they are called battlegroups - BGs). One of the differences between the games is that in FoG, the BG size is variable, where as in Armati the unit sizes (within any given troop type) are uniform. In practice, we made the (few) Saracen Heavy units into 4-base BGs, but amalgamated the Turcomans and LI/SI foot roughly so that their Armati divisions became FoG BGs (of 6 bases). On the Crusader side, we similarly kept the HI units the same (4s), grouped the main body Knights into 4s, and amalgamated all the Turcopoles into a single 4-base BG. This left both the Templar and Hospitaller Knights (the vanguard and rearguard) with just a pair of bases each. Historically these were pretty small contingents, and the 2-base knight BG does exist in FoG (just not in the Late Crusader list) - so we decided to leave them as little elite units ... to see what would happen. Deployment, approach to battle etc. This phase of the of the Field of Glory game worked better than expected. I knew that the FoG systems would be handy with respect to the Crusaders deploying from the march. I was a little more concerned about move distances and shooting ranges (as these are much longer in Armati): I didn't want us to have ended up with the forces too far apart, and spending all day on the approach. In fact, although you do have to get quite close to make the shooting effective, FoG has very few complications until you get there, so, like Armati, you can get on with it (gone are all those excruciating hours of irrelevant Pip management that DBM made mandatory just in order to get two distant armies to close with each other ... you can get to the proper battlegame quite quickly). In fact, in our game, the Saracens moved across the plain and closed around the marching Crusader columns in a very similar pattern to the familiar Armati envelopment (both games encourage proper battle lines, Armati with its manoeuvre divisions, FoG with its commanders moving linear arrays). We quickly got to the phase where the Saracens were shooting, and the Crusader commanders (Chris, ably assisted by a cluster of visitors who seemed pleased to stay with the game) needed to decide how, where and when to drop out of their columns, and organise a proper response to the intensifying harassment. Armati, of course, normally starts the battle with armies deployed opposite each other, and only allows an (authentically) restricted capacity for units/divisions to turn, wheel, expand etc. A big chunk of the scenario, therefore, sets the parameters for deployment - fixing the orientation and composition of divisions, where and when they can be set up. This is quite complex, but worth the trouble ... as you get to play the game with a very good set of rules. In this situation, FoG's comprehensive movement and manoeuvre rules are a real winner. For symmetrical set-piece battles, they are undoubtedly over elaborate (and if you were playing any of the open field Hoplite battles, you really ought cross most of the 'Simple and Complex Moves' page out). Here, it saves all the extra rules the Armati scenario needs. Everyone can turn to face the enemy, BG's can deploy with gaps in between ... Knights can deploy on a one-base width in order to charge through the gaps in the Crusader infantry line (and expand later and/or in the melee if they can bring one about ...) ... all pretty much as we imagine it must have happened. 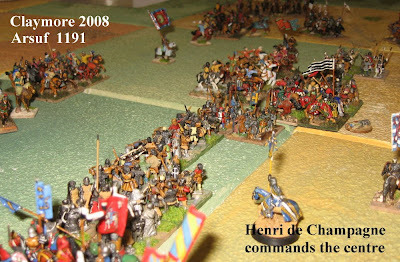 Again, there are issues of balance to achieve: although the Crusader infantry was seasoned, and (on this march) evidently excellently disciplined, I thought that they ought to take Complex Move Tests to deploy (a CMT is a simple 2D6 dice roll, modifiable around a 50/50 chance)... that would make them 'undrilled' in FoG nomenclature. Keeping the Crusader BGs small certainly helped out this phase of the FoG game. I don't really buy the 'shot = no shot' (no point in rolling the dice...) that commonly happens in the standard game (if twice as many shooting might have an immediate effect, why do smaller numbers shooting for several turns never need even pick up the dice?) . In this game, with the Crusaders in 4s and the military orders pairs, the shooting was consistently exciting. I suspect, in the fullness of time, correctly balancing the BG size of shooter and target will be an important component in designing FoG scenarios. A successful ratio of hits to the target's unit size forces a Cohesion Test, and it is collapsing cohesion which causes BGs to rout. The effects of intense archery gave encouragement to the Turks, and some failed Cohesion Tests forced the Crusaders' hand. Where FoG does outclass many contemporary games is in its 'old school' sequence of declare charges/evade/dice for evaders-dice for chargers. This makes the whole process legible and exciting (like WRGs 6th and 7th edition) ... whereas Armati is legible but a little predictable - it is all on the 'whole turn' initiative roll - and, of course, DB's abstract way of doing skirmishing was just dull. Here, the sequence follows our understanding of the engagements ... the skirmishers need to get close to get their hits. If the shooting isn't doing too well, the target player will be happy enough to try to move closer without charging. 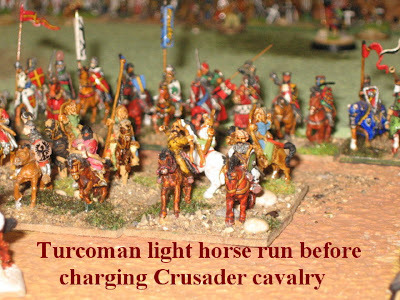 If he takes damage the impulse will be to charge sooner rather than later (either they will run away which might be good, or they will be caught ... which will be better)... Crusades games are all about this interaction ... Knights against Turks ... Shock troops against mounted archers. Everyone enjoyed this phase of the game. It was obvious that the skirmishing needed to be neutralised, it was equally obvious that the knights and Turcopoles needed to press the attacks home if they weren't to end up pulled out of position and surrounded by hostile archery. An important charge was made by the Templar Knights in the vanguard. 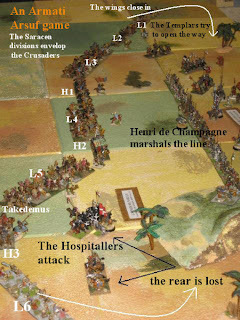 At the end of the line, the Turcopoles (deployed by us as Light Horse, not Cavalry ..).. were getting the better of a larger unit of Turcomans who had decided to put their faith in numbers.... but the position was still compromised. A successful charge, now, would gain the Crusaders the upper hand. Actually, both target and charger threw 6s , so the charge was futile, and also pulled the Templars way out of position. 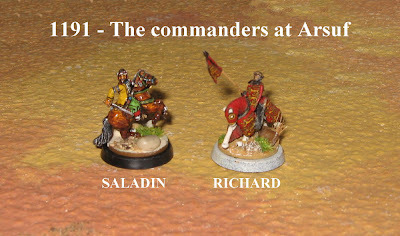 They survived the shooting phase of their own turn - but the Saracen move saw them assailed from all sides. Although they still passed the Cohesion Test, they had to roll at least a 4 on a death roll not to lose a base. They failed, and in FoG BG's reduced to only one base are dispersed at the end of the turn. This mechanism worked nicely in everyone's opinion: ... the brave Templars surrounded, undefeated and undeterred ... yet shot down to just a few militarily insignificant stragglers. The Saracens looked to be getting the upper hand. In the centre, it looked no better ... with Cavalry and LH horse archers liberally scattering Cohesion test failures about amongst the infantry. The bigger BGs of Crusader knights committed only to chase vainly after evading Ghilman cavalry ... Again everybody liked the way this passage of play depicted the relative flexibility of the fighting styles. At this point, the Saracen player (me, that is) made some crucial mistakes .... in the centre, the first of two BGs of knights charged after some (evading) Turcomans. As these knights were disrupted (one rung down the cohesion ladder), some enterprising Ghilman cavalry launched an interception charge. Adjacent, the next Turcoman BG had declined to drop back in front of the other knights (electing to keep in close range of some infantry who had just failed a test ... and trusting to a '35/36's die roll to get away when the knights charged...). Both calls were bad. The evading roll of 1 was not enough to get away from the charging roll of 6. The disrupted knights next door still converted their 'impact' advantage on the Ghilman BG. A disaster, and a losing melee were the twin results. To grab back the initiative, in the following Saracen turn, I declared a charge with the Saracen guard cavalry on a disrupted BG of 'defensive' Spearmen. A critical point in the line, they could be taken out quite quickly, and the Saracens would be through. Actually, the charge was a catastrophe, and the guards were immediately in trouble. This game worked out very well. Field of Glory 'dropped into' a unit-based scenario with very few complications. As a rules set to play 'historical' Crusades, it worked in a clear and entertaining way. In the battle we played, the game's narrative was clear enough... the Saracens seemed to have the upper hand until the player tried to capitalise over-aggressively and found his troops in melee with the Crusaders. They are good at this, and it should be avoided at all costs. The game was lost very rapidly. The Armati game has been played dozens of time, with a very even distribution of results. We played this time with Field of Glory, and the Crusaders won hands down, once Saladin had made his mistakes. Actually, for what it is worth, that is a historical result - but there is no way one can speculate about the balance. 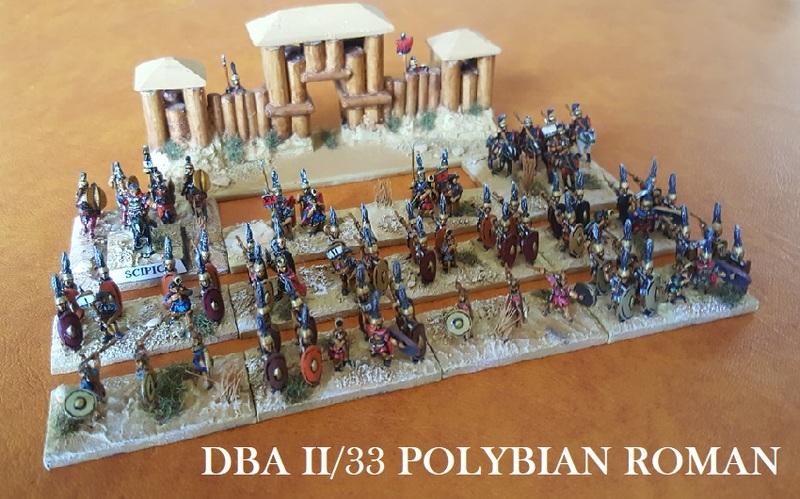 Field of Glory Scenarios: as mentioned before, we thought the 2 BG size for the military orders worked very well, and I suspect it is the right way to go for scenarios. Players would not do this for tournament games, and bigger BGs of military orders knights will be very powerful. An important way of approaching these balance issues in designing the scenario is listing the units already in partial decline (starting disrupted, or disordered from the defile etc.). We started everyone fresh, but only for ease of set up. Historically, the general engagement at Arsuf was prompted by the master of the Hospitallers (the rearguard) disobeying Richard's orders not to charge. Obedience is not a problem in the standard FoG game, but will be quite an important feature in developing plausible historical scenarios. There is quite a lot of potential here, and scenario designers have been given a pretty blank canvass. All in all, a very worthwhile experiment. Field of Glory does 'attack on a marching force' well, and its 'charge and chase' mechanism suits the Crusades period ideally. Whatever the issues of balance maybe for tournament play, everything is there to make FoG an adaptable system for building up interesting historical scenarios. Thanks to everyone who joined in at Claymore. Oh! Sorry .. Armati versus FoG? Too early to tell. As explained, this is exactly the sort of scenario that suits FoG's game type, and it did very well. The Crusader army and leaders were, however, too disciplined in my view, and in writing a scenario for this battle in future, I would concentrate on making the command and control far more challenging. This battle happened because, despite all the preparation, Richard lost control of the army ... and not its 'greener' European contingents, but its 'professional' military orders. 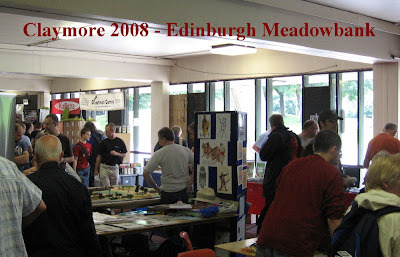 The weekend brought the opportunity to make a long drive up to Edinburgh to SESWC's flagship wargames show, Claymore. Thanks to Colin and the organising team for inviting us ... sorry it took til late on to put our package together, but from our point of view it was well worth the trip. It was a great opportunity to meet so many of our Scottish members for the first time - a big thank you to all of them for calling by and making us feel so welcome. 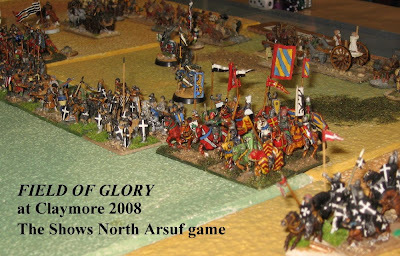 In addition to taking up the Society literature stand and a wad of glossy new Slingshots, we decided that a suitably topical thing to do would be to run an experimental version of our Armati Arsuf Scenario from last year with the new Field of Glory rules. Topical? Well a combination really. FoG is a topic many ancients enthusiasts are interested in (how do they work, do they give the right 'flavour', how would they cope with historical scenarios etc.)... and the grapevine had already informed me that Dave L had had to cancel the planned Arsuf game that was to form the Lance & Longbow Society's centre-piece. So, with a week to go, there was going to be no Field of Glory at Claymore, no Arsuf presentation, and although Colin had kindly reserved the Society some tables, nobody had volunteered a Society of Ancients game. I thought we could fix all those items. The downside, necessarily, is that at this stage neither I nor Chris, who assisted, are adept enough, really, to present FoG at a show (neither experts nor practiced). I'm sure that was evident to everyone! Perversely, however, it seemed to work with a fair few fellow enthusiasts all day long. Many of them were just as intrigued as us, and maybe were put at ease by the fact that we were beginners too. 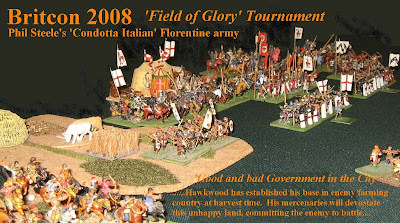 The upside was both that a number of visitors were happy to get involved, and that Field of Glory actually did a pretty good job of handling the battle. Given all the chat, meeting and greeting (and a fair amount of looking things up! ), we only played the game through fully, once. However we did work things through to a decisive outcome, with the Saracen army in general retreat. 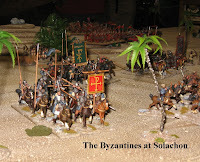 I will post some more detailed feedback in a separate report ... suffice, for now, to say that although Saladin's army got some impressive early results, they were defeated wherever the Crusaders managed to tie them down in hand-to-hand combat. Although this is a pretty obvious feature of a Crusades engagement, in truth, not all rules systems do give that result, and how FoG got us there was both plausible and entertaining. Special thanks also go to Alan and Phil who volunteered to take charge for a spell around midday - so Chris and I could get some refreshment and have a look round. I was very impressed by a genuinely diverse and eye-catching mix of games (and a fair mix of things to look at and things to play). 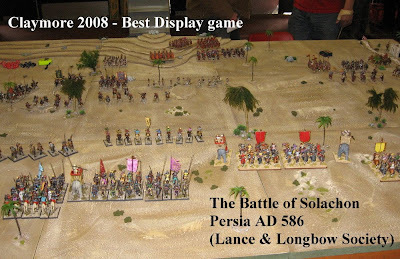 Best display game was the Battle of Solachon - the last minute stand-in for the Lance & Longbow Society (AD 586, and something Richard might look at in his count down to the 2009 Battle Day ... he already favours Byzantines and Sassanids ..) - yep, I wish I could get games looking that good at the last minute! 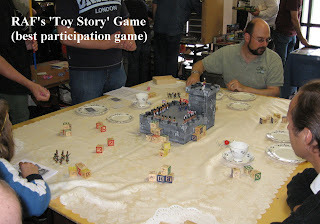 Best participation game was the RAF Wargames Club's 'Toy Story' and off-beat teatime game with Eureka's engaging range of nursery-style figures coming to life. Back on topic, the St Helen's and Ashton Spartans (the Phalanx people) had brought a phalanx along. 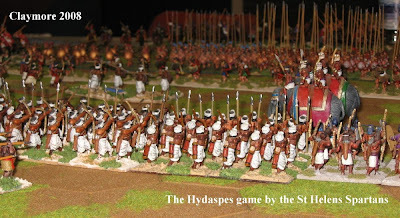 An impressive, and impressively linear refight of the Hydaspes (you can find out more about them and the home-grown rules they use here ...)..
Well, you might be wondering at this stage about that Lance and Longbow Society game ... AD 586? Hmm? I have to say my tongue was stuck firmly in my cheek. It has to be the earliest demo game the LandL Soc have ever put on. As our Arsuf game added to an existing 2008 Society of Ancients Poitiers theme, maybe this signals that Dave will be leaving the Medieval period to us, and opening up their display space to prize-winning games in any related periods. I'm only teasing, of course, and am aware of the last minute changes. Solachon was a good choice (look at the pictures) ... Between ourselves, Phoenix and Lance and Longbow, the advanced information (or lack of it, from us ...) could have been quite misleading ... as it is, Claymore did indeed get the Battle of Arsuf, and a 28mm 'ancients game' - and I think ancient and Medieval enthusiasts got stuff to do and things to look at. My thanks again to the indulgent people who stopped by, had a chat, helped out etc. You made the day for us. And to our hosts, the SESWC, who had put together an attractive and friendly show - as I'm assured they usually do ... but it's nice, for newcomers, when it's true. We're already working on making some effective arrangements so this and the other Scottish shows can get fuller coverage, and local enthusiasts whatever back-up they might need.